Our third day started in a familiar way with a discussion over synoptic charts and what they meant for the day ahead. This is an area I found quite easy, with a background in teaching geography, but others knew little about interpreting the isobars and understanding the impacts of fronts. If this is an area you are not particularly happy with then I would suggest you do a bit of reading on this before training. Check out GCSE geography websites for weather and climate as the level discussed on training is not much more advanced than that. It won’t make you an expert but it will help, especially if you take some time and put it into practise. We stayed in the lounge and were told that today would be steep ground management with a focus on rope work. With a variety of ropes, varying in length, width and treatment, discussions began around what the expectations are for a Mountain Leader when it comes to using ropes. The key point is that although you would carry a rope for emergencies you should not plan on taking a route where you will be using it. If you plan to use it then that route is out of the ML remit in reality. As we departed the Coppermines YHA for the day we had a perfect opportunity to get our adrenalin pumping with an early morning scree run! I absolutely loved it. It was interesting listening to the technique (getting your heels down first and digging them in) rather than my normal approach of living on the edge of balance and injury. I did have flash backs to Skippers Canyon in New Zealand where I slid face first down a similar slope after letting my adrenalin take over and not listening to the warnings of my mountain bike guide! As you can imagine, this kind of activity was not to everyone’s liking but to the group’s credit, everyone did it. Finding a ‘bomb proof’ anchor is one of the most nerve racking things and I can remember this so clearly from the first lead climb I did last year. There were two straight forward techniques in finding a spike or a thread to anchor the ropes to. You are in a situation where your anchor needs to be solid and the knots you use to secure it have to be spot on too. This is where it is really difficult as a beginner because you doubt everything. Knowing that you are responsible for the safety of others around you means that the doubts are intensified as you check and double check everything! Experience with ropes in these situations is not a prerequisite but I certainly felt more confident than some of the others in the group. We had an older member of the training group who was a ridiculously experienced climber and this was all too easy for him. He was still interested in everything as the leadership aspects were completely new for him. This is where the mixture in our group was really good and allowed us to bounce ideas and questions around throughout the day. Through the day we practiced finding the anchors and looking at knots but we only needed to master the overhand knot as it was all about simplicity and security. After lunch we continued finding anchors and using the overhand knot but the aim was on belaying group members. Again the technique for this is made easier with some experience rock climbing as it takes away an aspect to think about. It takes some time to identify a useful anchor as you are constantly wondering whether it is strong enough to hold weight. Looking for cracks, fractures and wobbles on large rocks and constantly doubting yourself on what would normally be a fairly simple task. 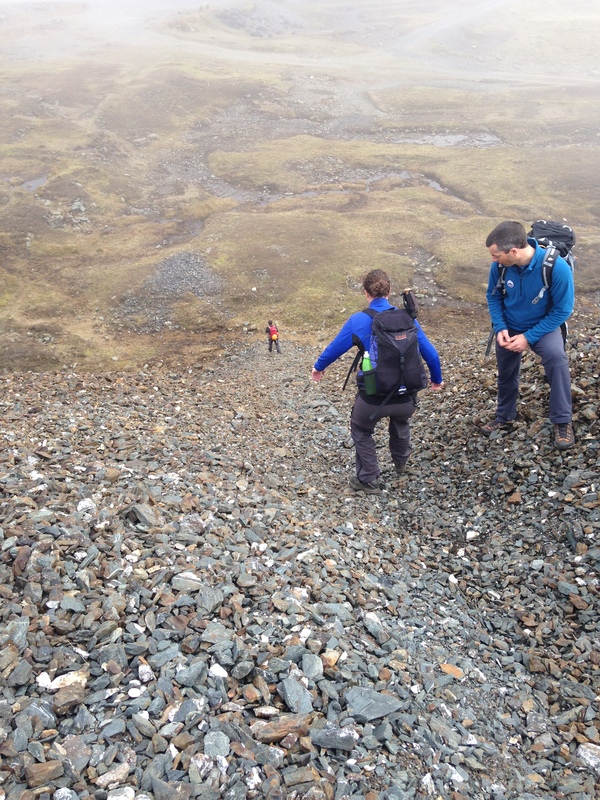 The pressure today all came from knowing the risk associated with steep ground and getting it wrong with one of your fellow trainees on the receiving end. We were then at the stage where we were belaying other members of the group. The area we were working in was not something that needed ropes let alone the belay but this was obviously perfect when learning about this. We were shown a number of belay techniques across the session including the South African Belay, traditional abseil, angel wings and hand-over-hand. We spent the majority of our time on the simple and effective waist belay. Once the theory had been covered we practised it over and over. Slight differences in seating positions, hand positions and moving the rope make huge differences to your ability to carry out the belay comfortably and effectively. Our last activity out on the hill was confidence roping. 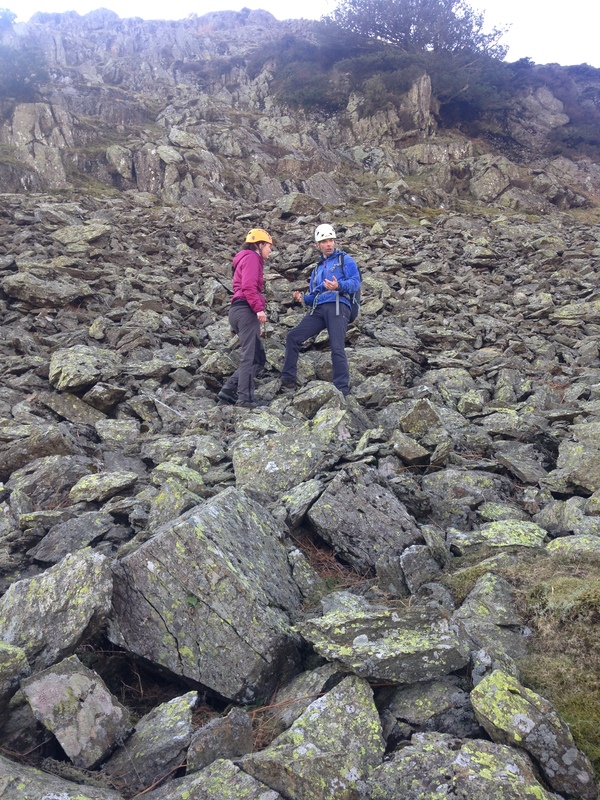 Thanks to Mick Fenwick, I had some experience with leading a group of students in the Lakes District in this exercise but it was great to see a different approach. This is essentially using the rope for confidence rather than security in a physical sense. 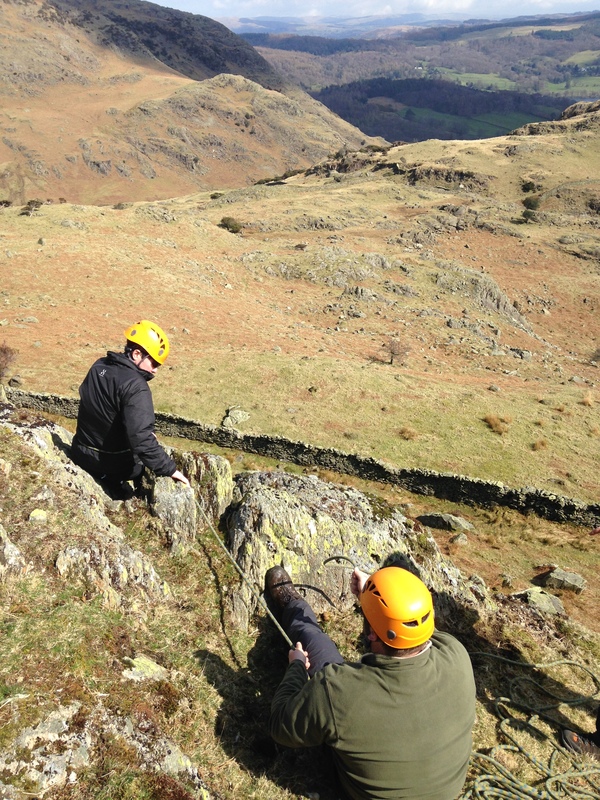 It allows someone to be helped across uneven or steep terrain with a rope. The aim is not to tie someone in but to give them the rope to hold on to while you lead them, which usually inspires confidence. The focal point when leading this is not the rope but on the communication between each person. This involved talking them through, spotting routes and footholds whilst being positive and inspiring that confidence that is needed. This was an enjoyable experience and interesting to see people leading it who do not come from backgrounds where this type of communicating is important. Our evening session was a kit talk for a group leader, as a non-overnight journey. The majority of this for me was reinforcement of my thoughts when I have taken groups out. There were some areas I have already identified to change but there were some items in my kit I realised might need taking out or changing and a few little extras that I will be adding. Overall, if you are taking this kind of course you will have a decent understanding of the kit requirements. Depending on your background that will obviously vary as the majority of people I spoke to came from having vast experience being outdoors where my recent experiences have been leading and supervising groups.